Secure Customer Index is a Customer Satisfaction measurement model developed by D. Randall Brandt, Ph.D (Maritz Research) in 1996. Most major conceptual and measurement models of customer satisfaction explicitly include elements related to customer value and customer loyalty. Satisfaction is a necessary, but not a sufficient, condition of customer loyalty (D. Randall Brandt, 1996). Customer loyalty is reflected by a combination of attitudes and behaviors. It usually is driven by customer satisfaction, yet also involves a commitment on the part of the customer to make a sustained investment in an ongoing relationship. Responses to the three items . overall satisfaction, likelihood to continue using the service, and likelihood to recommend . can be combined to create multiple classifications or segments based on the degree of customer security. 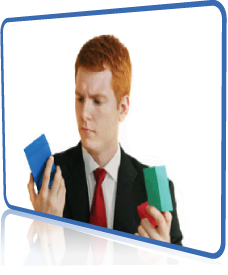 Conjoint analysis is used to study the factors that influence customers, purchasing decisions. Products possess attributes such as price, color, ingredients, guarantee, environmental impact, predicted reliability and so on. Conjoint analysis is based on a main effects analysis-of-variance model. Subjects provide data about their preferences for hypothetical products defined by attribute combinations. Conjoint analysis decomposes the judgment data into components, based on qualitative attributes of the products. A numerical part-worth utility value is computed for each level of each attribute. Large part-worth utilities are assigned to the most preferred levels, and small part-worth utilities are assigned to the least preferred levels. The attributes with the largest part-worth utility range are considered the most important in predicting preference. Conjoint analysis is a statistical model with an error term and a loss function. With SurveyAnalytics's Conjoint module you can collect the data and simulate it through our conjoint simulator. Where in you may ask the respondent to arrange a list of combinatios of product attributes in decreasing order of preference. Once this ranking is obtained, you can use our advance simulator to simulate the data that will give you graphical representatio of your data. This method is efficient in the sense that the survey does not need to be conducted using every possible combination of attributes. The utilities can be determined using a subset of possible attribute combinations. From these results one can predict the desirability of the combinations that were not tested. How to set up Amazon.com Gift Card rewards integration? You can set up Amazon.com Gift Cards as rewards on your survey. The first step is to set up the Qualifying Criteria. From the Reward drop down, select the Amazon.com Gift Card option. By default, Test Mode will be on. Keep it On for testing. Turn it Off only when you want to start giving gift cards live. Enter the Gift Card Value. Each gift card will be worth the entered value. Enter Number of Gift Cards. Additional gift cards can be added later on. Enter your headline, message and image (optional) for the Reward Page. This is what respondents will see after winning the Reward. Review and Confirm. One time fulfillment fee of $15 will be charged in addition to selected gift card value and number of cards. What happens when test mode is on? When test mode is on, rewards are not fulfilled. 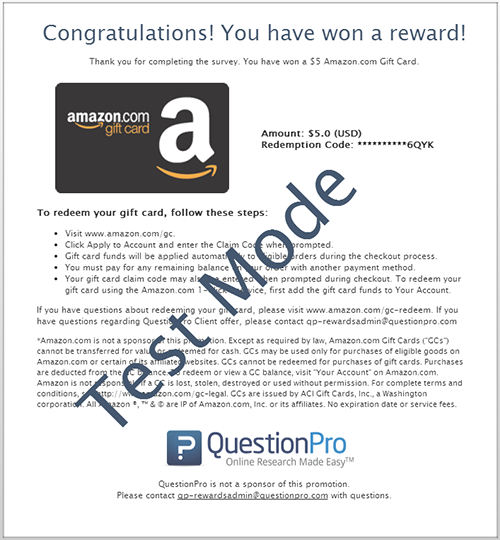 This enables you to test the survey without using up your Amazon.com Gift cards. On the survey, when you fulfill the criteria for winning the reward, test page for reward will be displayed. Once you are done with testing. Turn Off the test mode and save. When reward is fulfilled, Amazon.com Gift Cards will be given out. Before making the survey live, please remember to delete test responses. Delete Test Responses - How to? 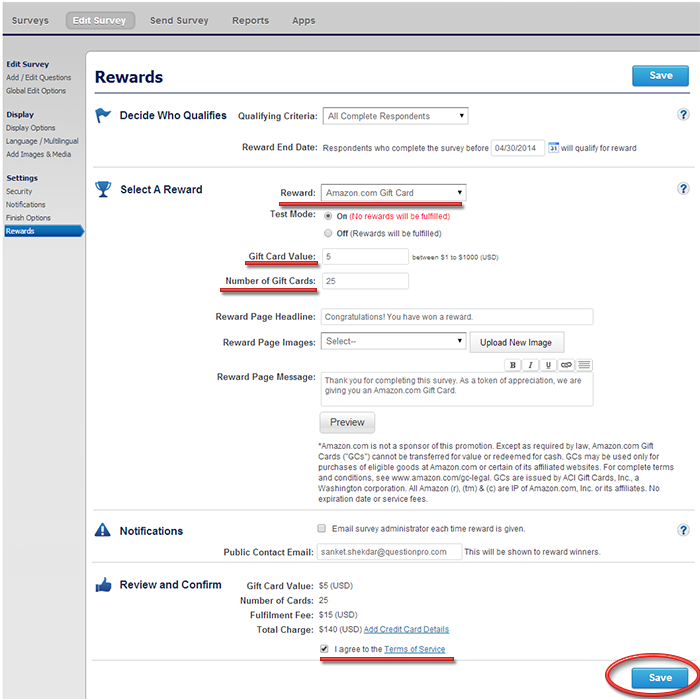 Free account never expires, unlimited surveys! Pro accounts for as low as $12. More reasons to get started? Take the tour and find out why QuestionPro is the leader in online surveys. 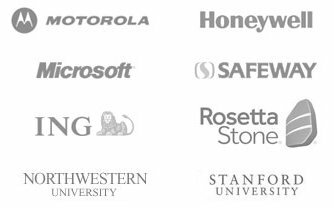 We're one of America's fastest growing private companies! We are placed 172nd with 1390% growth. Join QuestionPro Now! It's completely Free!